it's just as important as the suction on your vacuum. 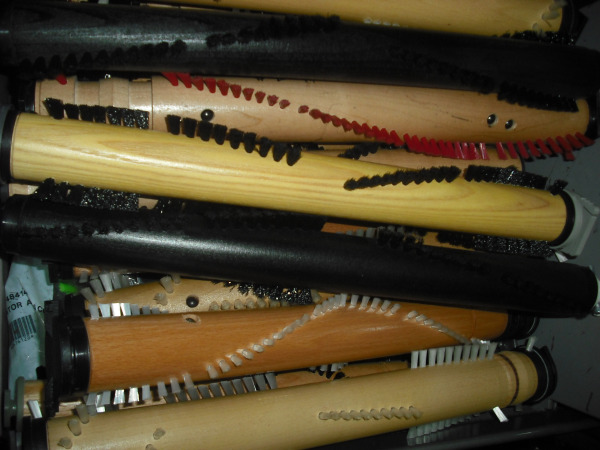 The brushroll on your vacuum cleaner needs to be replaced regularly. The brushroll lifts the nap of the carpet so the suction can grab the dirt. The brushroll moves the dirt into the suction path. When we use the vacuum on the carpet, especially a thicker carpet with some nap, it is the brushroll that leaves the carpet looking good. Most people like to see the lines in the carpet when they vacuum. Some like to see a V-Shaped pattern. This can only be done if the brushroll is in good shape. The brushroll fluffs up the rug. Because the brushroll is the part of the vacuum moving over the carpet and doing most of the work, it wears out and needs to be replaced regularly. Like a toothbrush, the bristles get soft and flattened. How often we replace the brushroll really depends on how often we vacuum, how clean we want to be and how good we want the carpet to look. On average a brushroll should be replaced every year or two. If you're not sure if the vacuum is working as good as it could or should be, replacing the brushroll can be an easy fix .